These are lyrics by Aerosmith that we think are kind of funny. Aerosmith's, "Dude Looks Like A Lady"
(Sax bleat x2) Dude looks like a lady! I believe the lyrics are in reference to Vince Neil (Motley Crue lead singer); the song was written back in the day when Vince looked very much like a female! Pink as the sheets that we lay on. Pink it's my favourite crayon. If anyone else but Tyler had tried this 'whoops I'm stuck' rhyme it would sound crass. He actually gets away with it. Pink it's like red but not quite. I laugh every time I hear it. Not out of ridicule but out of respect. Nobody but Steven Tyler could have carried off 'Pink... It's like red ...but not quite. The man is a genius. 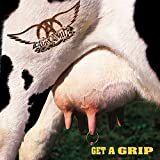 Aerosmith's, "Shut Up And Dance"
You aim, you shoot, you run!